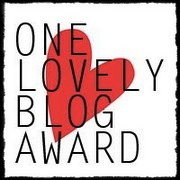 Stories & Soliloquies has been nominated for the One Lovely Blog Award, which is really just a nice way to get bloggers to connect to each other and give the nominee a chance to tell his or her readers what else they ought to be reading. I was nominated by the lovely Christa Wojo from My Sweet Delirium, a blog about writing and creativity. You may remember Christa from my recent experiment with a “Roast” style writing review. Her blog is most certainly lovely. Nominate the authors of 15 blogs to participate and do the same, linking back to the original Lovely blog. I’m going to cut this down to 5, since I participate in these blog hop events often enough that I cover a lot of different blogs, and also so you can spend 3x as much time browsing each one. But first, 7 Lovely Facts about me. 1. I collect teapots, and teapots are basically the epitome of lovliness. I’m trying to build my collection as slowly as possible so that each teapot has meaning. My favorite ones are gifts from friends and family, but I also love the large Brown Betty I bought myself a few years back. I currently have eight teapots. 2. When at home, I write almost exclusively with a fountain pen I received as a gift last Christmas. It’s such a treat. I always feel fancy when I use it, and I’m even starting to take it with me to school. I might need to grow my collection to two fountain pens. 3. I make excellent french toast over the campfire. I use the lid of cast iron dutch oven as a griddle, and always make them the first morning so we don’t have to keep the eggs too long. 4. I prefer Bed & Breakfasts to hotels. They’re far more cozy, and you get breakfast. I’m still working on my breakfast conversation skills, but I like the imperative to get up at a certain time with the intention of starting your day with a social activity. 5. I just joined a book club in a far away place. I’m going to Skype into my first meeting tonight to discuss Chesterton, and I’m very excited about it. If you’re looking for the perfect book club but can’t find one in your area that reads what you want to read, ask friends and family members in other places to see what’s available. 6. My creative muse is a fickle beast. Last month, I was all about painting. Before that, I was fixated on learning a specific song from the 2004 Pride & Prejudice soundtrack on piano. This month, I can’t let a day go by where I don’t play the ukulele. Next month, NaNoWriMo is going to take my full attention. I used to feel like I had to pick one and stick with it, but I’m learning that these different impulses feed each other. 7. I carry a book, a notebook, and a pen with me wherever I go. I feel completely unprepared when I’m without these three items, even though I often never touch them. But every time I leave them at home, I find myself in a situation where I could really use them, so it’s best to be prepared. And now, 5 Lovely Blogs you should check out. 2. The Oddest Inkling: With so much material devoted to JRR Tolkien and CS Lewis, it’s wonderful to see a site devoted to their less famous friend, Charles Williams. He’s quite the character, as it turns out. 3. I Create Worlds. John Brito’s Blog: This blog is the epitome of dark and lovely. Brito’s art is amazing and always tells a story. Everything is fantastic. 4. Listful Thinking: Witty, surprising, and interesting, this blog is a delight to read. I don’t usually go in for general personal reflections (preferring topic driven material) but I got sucked into this blog one day and now I read every post as it hits my reader. 5. The Irish Aesthete: If you’re interested in history and architecture, this is the blog for you. There are wonderful pictures and wonderful explanations that help you find the lovely. I hope you enjoy checking out these blogs, and remember – since this list was supposed to contain 15 links, you now have leave to spend 3x as much time as you would normally spend checking these out. They’re worth exploring.